The 3-year old Bonheur, the 4-year old Dunhill, the 5-year old Carlton Hill, the 6-year old JJ Rayban and the 7-year old Isac became the national champions at the 2012 Swedish Young Horse Championships in Flyinge, Sweden. The national state stud was action packed for the entire week from 1 - 7 October 2012 for these national breeding championships. In the 3-year old division Mia Runesson and her own and Johan Ifversson's Swedish warmblood gelding Bonheur (by Bocelli x Furst Heinrich) were the favourites of the judges and received the champion's sash. Ten horses were picked for the finals after a first presentation round and in that finals Runesson's Bonheur scored the highest total of 87.000%. The horse got 7.5 for walk, but 9 for trot, 9.2 for canter, 8.8 for submission and 9 for general impression. 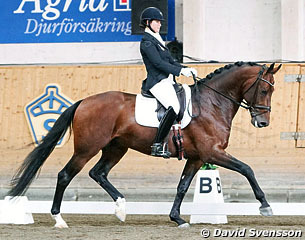 Sandra Sterntorp, who qualified no less than three horses for the finals, finished second with Johan Ifverson's German bred Final Cut (by Furst Romancier x Dormello) scoring 86 points in total. The horse got 8.3 for walk, 8.7 for trot, 8.5 for canter, 8.7 for submission and 8.8 for general impression. In the 4-year old age group Minna Telde and the Dutch warmblood Dunhill (by Oscar x Cocktail) surfaced at the top with 91.375 points. The 4-year olds have to do one qualification round and ten moved on to the finals in which Manuel Bammel and Danish Grand Prix rider Michael Sogaard served as guest judge riders. Dunhill won the qualification round with 84 points and totalled 98.750 in the finals. Pether Markne and the Dutch warmblood Desendo B (by Don Romantix x Sandro Song) became the reserve champions with an 80.40 in the first round (5th place) and 91.250 in the finals (2nd) to finish on 85.825 points. "It was an intense week with fourteen rides in total," busy-bee Telde explained. "Everyone at the farm has helped to drive the horses back and forth, helped with braiding and getting the horses ready for their start. It was quite the logistics to get everything done and ready, but we've had an incredibly good week. The 5 and 6-year old categories at the Swedish Championships work like in Germany and at the World Championships. One qualifier for the finals, a consolation finals and the actual finals in which that score counts for the final standing. Mia Runesson and Gransbo stud farm's 5-year old Dutch warmblood stallion Carlton Hill (by Uphill x Vincent) topped the leader board with 86.800 points. The bay stallion got 8.3 for walk, 9 for trot, 8.9 for canter, 8.2 for submission and 9.0 for general impression. Sandra Sterntorp and Elizabeth Ball's Westfalian bred Rausing (by Rock Forever x Dimension) became the reserve champions with 85.00 points. The sympathetic bay earned 9 for walk, 8.7 for trot, 8 for canter and submission and 8.8 for general impression. In the 6-year old division Jan Brink and Hannell's Hanoverian licensed stallion JJ Rayban (by Rascalino x Londonderry) claimed highest honour with an 85.80 total score. The long-legged chestnut stallion got 7.6 for walk, 8.6 for trot, 8.7 for canter and 9s for submission and general impression. Mia Runesson and the Swedish bred Barcelona (by Figaro R x Bernstein) landed the reserve champions' title with an 80.00 total score. This horse earned 8.5 for walk, 8.3 for trot, 8.0 for canter, 7.2 for submission and 8.0 for general impression. "RayBan gave me a great rider's feeling and showed he has good nerves and elasticity in his gaits," said Jan Brink. "He showed that as a stallion he can be ridden in such an environment in full harmony with his rider." The 7-year old dressage horses contested each other in a Prix St Georges test as Finals. Judges by Anette Fransen-Iacobaeus, Dieter Schule, Wiveca Schenholm placed Minna Telde and her Swedish warmblood gelding Isac (by Hip Hop x Master) first with a 75.877% which was miles ahead of the second placed pair. Telde's Isac has now booked his third, consecutive Swedish Young Horse title in his career. Louise Almund and the Danish bred Mr Gold G (by Milan x Lobster) slotted in second with a 69.254% score. "Isac was with me the entire time and just wanted to do everything right," Telde explained. "That feeling you don't get very often in the ring. it was a great feeling!"